Sassy Spoon is the one restaurant that I feel 100% confident walking into. I don’t need to ask questions or feel like I’m bothering them with my food requests. Why? 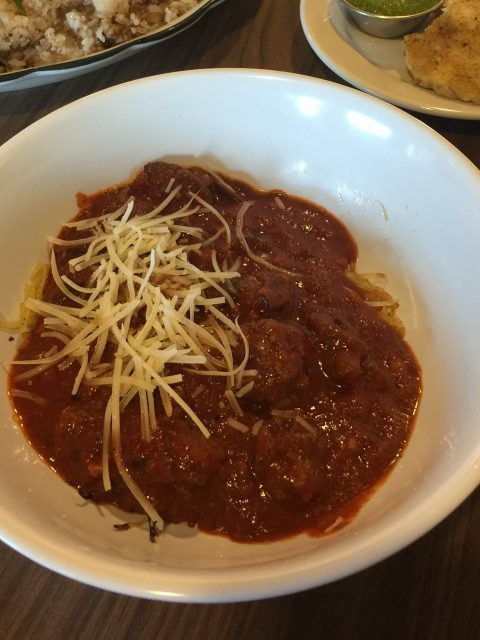 Because this place is 100% gluten-free and it’s literally blocks from my house. Lucky me! I had been to Sassy Spoon a couple times before my diagnosis, but I didn’t love it. Probably because I just didn’t appreciate how great the food was. I just thought it was too “healthy” for me. Well, I absolutely LOVE it now and I’m so thankful that there is a restaurant like this. 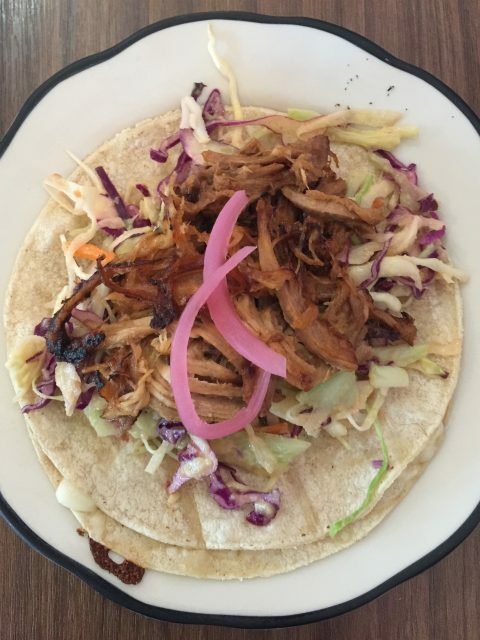 Not only are they gluten-free, but they use local ingredients, healthy fats, and they serve gluten-free beer and wine! 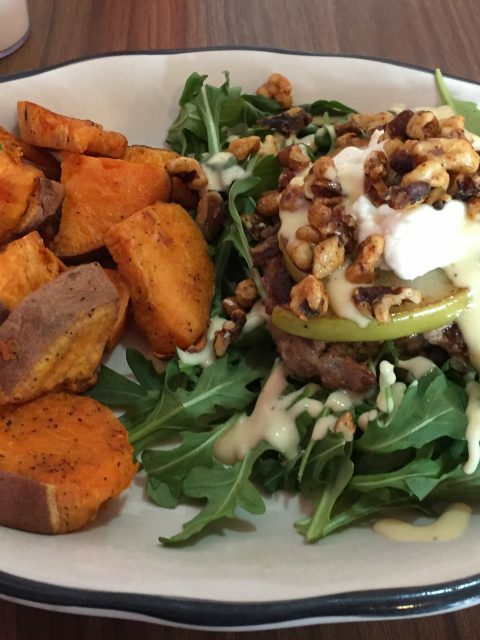 We’ve been there mostly for dinner and one time for brunch and have tried everything at least once. 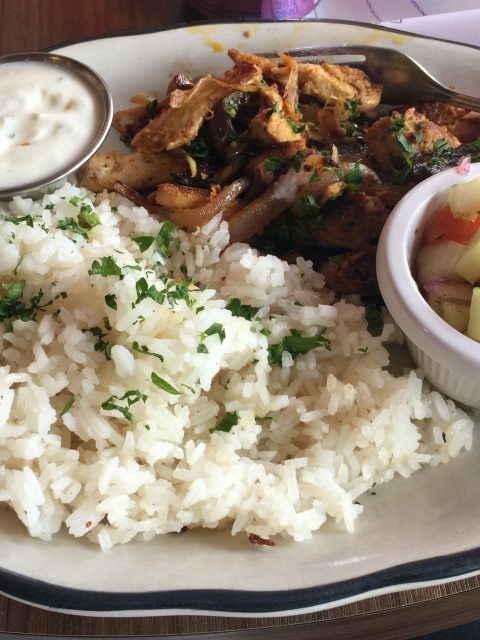 One of my absolute favorite things on the menu is the chicken shawarma with white rice. It’s perfection. And the homemade tzatiki and cucumber salad on the side is just perfect with it. 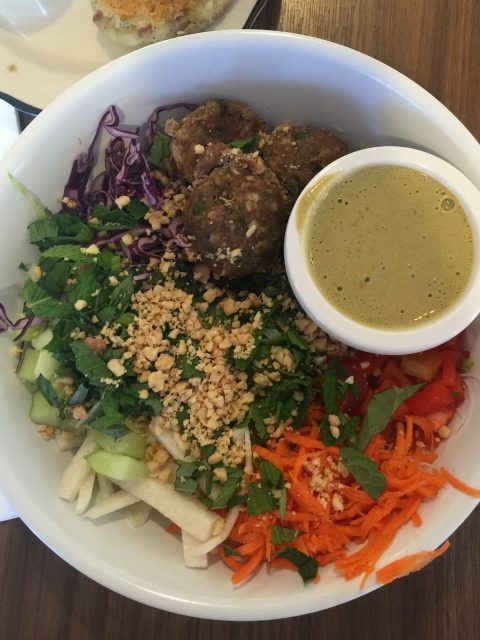 Another one of my favorites is the spring roll salad. 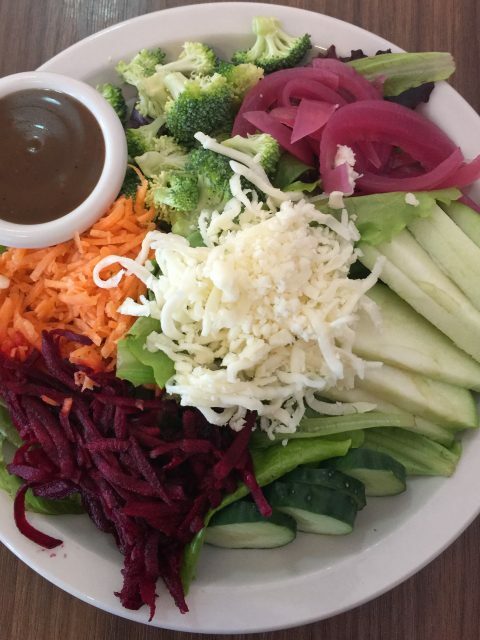 It’s like a deconstructed spring roll in a salad version. One night we were there and sat at the counter for dinner and we were able to watch them prep some of the sauces for the next day, including the peanut dressing for this dish. It’s so great knowing what you’re putting in your body is “real” food. 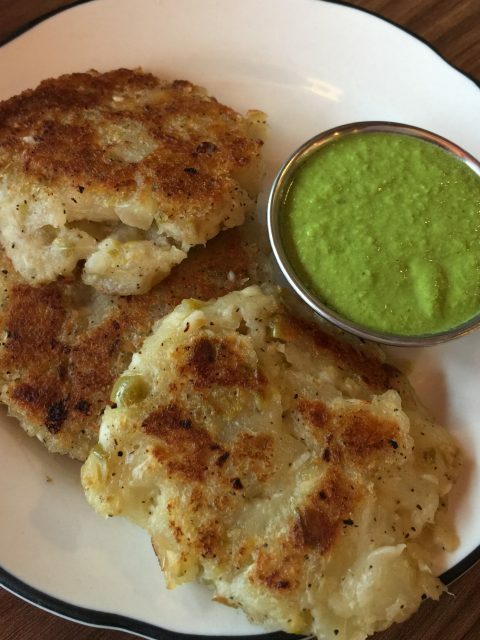 Man, I forgot about the yucca patty appetizer with cilantro dipping sauce. Oooh yum. Seriously, everything is so tasty. 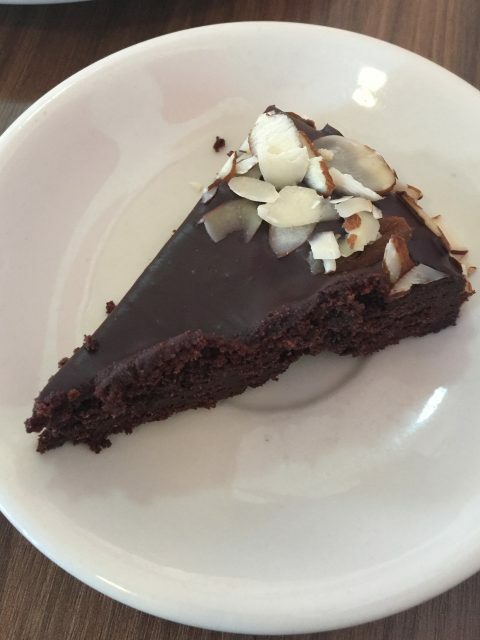 They also have some house made baked goods that change from time to time – they almost always have gluten-free cookie dough bites though!! Recently, they’ve been offering take-and-bake shepards pie and bone broth. 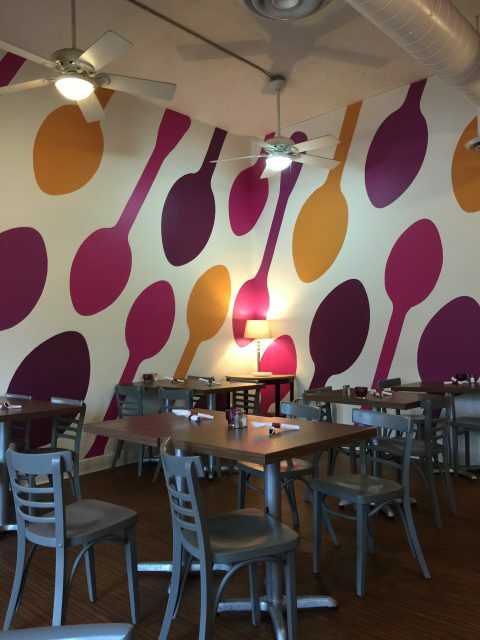 The walls are covered in brightly colored spoons – how sassy! The staff there is always SO friendly and welcoming. 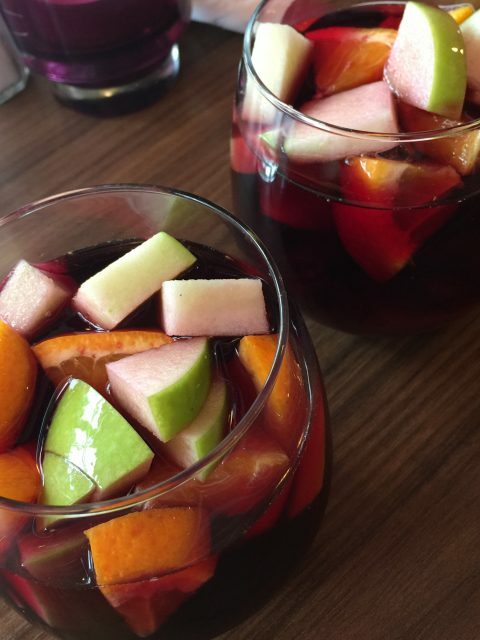 It’s really a very unpretentious atmosphere with excellent food. I feel so fortunate that this restaurant is walking distance from my house. 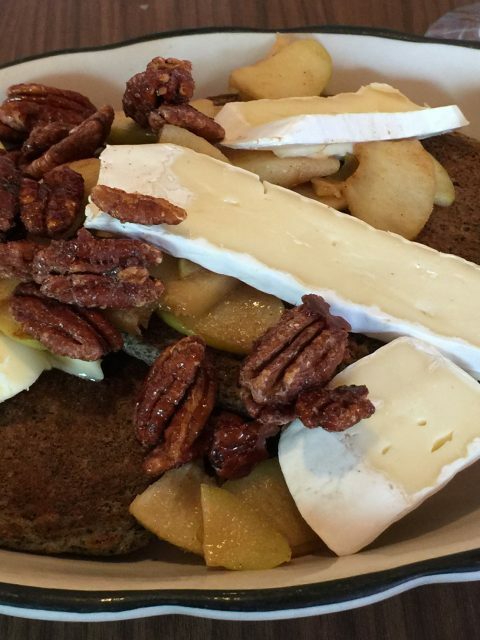 Now that I’m thinking about Sassy Spoon, I think I’ll need to go back this weekend for brunch! !